The Dirt Doctors’ Grant Campbell provides an insight into the communication style of one of our popular Sharing Good Practice events, whilst casting a light on some of the current issues and challenges around the sustainable management of one our most precious resources – soil. Grant is a regular contributor to Dirt Doctors, a blog run by a group of PhD students from Cranfield University’s Soil and Agrifood Institute, as well as a prolific Tweeter (@Stato_Grant). Earlier this week I took a day out of the office to attend what looked like a very interesting networking event in Perth on ‘Making Soils Count’, organised by Scottish Natural Heritage (SNH). 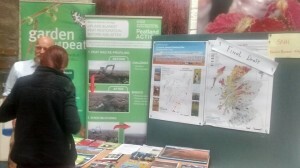 The meeting’s purpose was to take stock and share a variety of soils knowledge that presently exists across Scotland. The meeting also provided an opportunity to explore the many techniques and applications currently available to describe and monitor soils. It brought together specialists and practitioners in identifying the challenges and how best to improve access and use of soil information. A few of us set off from Aberdeen, including one of my PhD supervisors, Allan Lilly. The journey down was fine until we got within 100 yards of the venue when, due to my personally shocking co-driving skills, we contrived to miss the entrance to the venue, not once but twice!! I’m still smarting about it! Anyhow, after we managed to arrive at our destination we settled in and started setting up. One of the immediate things I realised when we arrived was the breadth of information that was going to be advertised at the event. There were people from an array of organisations such as the Scottish Environmental Protection Agency (SEPA), British Geological Survey (BGS), Forestry Commission Scotland (FCS) and Centre for Ecology and Hydrology (CEH). I also made the most of the opportunity to pick up a whole stash of freebies that were on most of the stalls! After registration, the conference got under way with an opening address from Eileen Stuart, the head of Policy and Advice from SNH. This set the scene for what was going to happen for the day. 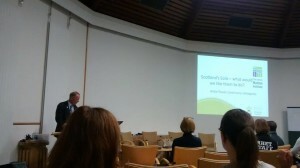 Second, The James Hutton Institute’s Willie Towers gave an address on Scotland’s Soils, posing the question to us what we’d like soils to do for us. Following Willie’s excellent presentation, Rebecca Badger, an Environmental Economist gave what was a very useful economical insight into the value of soils, which from my own personal view I hadn’t thought about in much detail until this point. The session then moved out of the auditorium where there was a ‘market place’ to investigate and find out more information. I used this session very wisely, advertising to people about the work I had been doing regarding my own questionnaire as part of my PhD. 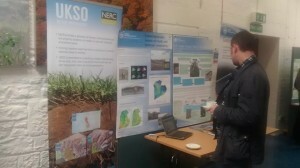 I also looked further afield, chatting to people about the use of Digital Soil Mapping in the mapping of key soil properties with future potential to map key soil functions. My discussions with a variety of people were both interesting and thought provoking, of which I will certainly take a lot on board going forward. After the interactive session, we were invited back into the auditorium where we heard a very interesting presentation by Andrew McBride and Klaus Glenk talking about their work on the value of peatland and the peatland restoration programme. This was then followed on by a presentation from Mark Aitken, Principal Policy Officer for SEPA who introduced the topic of sustainable soil management in improving water quality. Both presentations were very thought provoking and triggered a few questions in my head, including the notion of communications and interaction. Should we be doing more with people to gain their own perspectives on certain key issues? I think the answer to that is a big fat YES! Speaking of interaction, after lunch (which was fantastic by the way: free and loads of food, just the way I like it!) 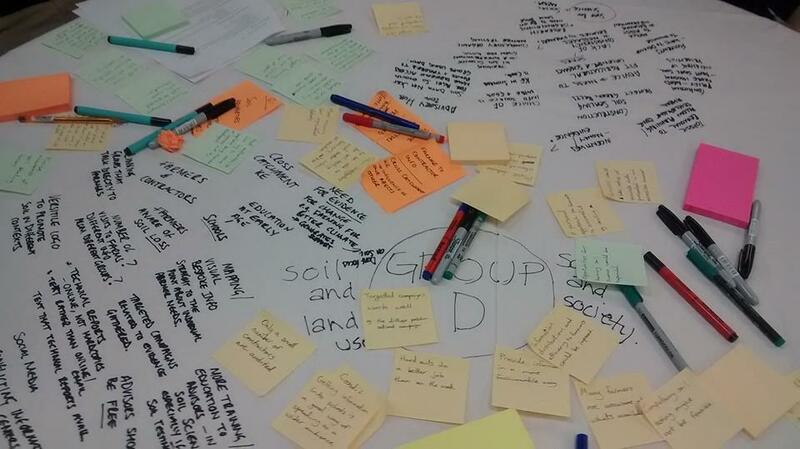 we were introduced to a café style discussion in groups which asked us to investigate the connections soils have with biodiversity, water, climate, land-use and society. Participants were split into four groups and circulated to all groups to give their points of view on the questions. These were looking predominantly at the research gaps, communications and interactions and any other information that we think we need to consider whilst looking into these areas. I had a very interesting experience with my group, where we primarily discussed soil and water, having the best discussion when we moved round to the soils and land-use group. In terms of communication, we were asked if we had heard of any new techniques employed to gauge the public’s interest. 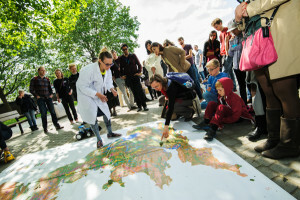 It was here that I had to give a plug to Dr Jacqueline Hannam and colleagues who work alongside @SoapboxScience which have taken place in London, Manchester and a number of other cities throughout this year. I felt this was gratefully received by the groups who wanted to know more about this. Special thanks to the guys who facilitated these sessions. We definitely should be increasing these. 1.It got me out of the office to meet up with a variety of people who are connected to soils information. I certainly increased my list of contacts there and made good conversation with people. 2.It has inspired me further about what I’m intending to do in the next stages of my PhD. 3.It increased my desire to present at one of these meetings in the future and give my own views on this particularly complex topic. The International Year of Soils 2015 (IYS2015) has been promoted highly over the last few months across an array of media. It is what we do post-IYS2015 that will be of interest. I’d welcome discussions of what we plan to do after IYS2015 is finished. I’ve got a few ideas up my sleeve, particularly within soils information…stay tuned! This post was originally posted on the Dirt Doctors website. For more info on Sharing Good Practice, including upcoming events and pdfs of all the presentations from the Making Soils Count event, visit our website. 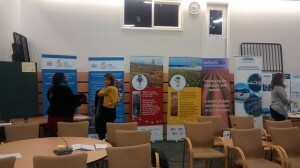 This entry was posted in biodiversity, Flowers, Fungi, Nature and technology and tagged @SoapboxScience, @Stato_Grant, battleby, Battleby Conference centre, biodiversity, Cranfield University, International Year of Soil 2015, Scottish Natural Heritage, SGP, Sharing Good Practice, SNH, Soil, soil science, The Dirt Doctors. Bookmark the permalink.